The connection between women’s economic participation and global prosperity is undeniable. Over the past two decades, international organizations and world leaders have increasingly recognized how critical women’s economic empowerment and financial inclusion are to economic prosperity and growth. However, despite growing awareness that women’s economic empowerment is critical to women, their families, and broader economic prosperity, many countries still legally undermine women’s economic participation and undervalue women’s work. Of the 189 economies surveyed in the World Bank’s Women, Business and the Law 2018 report, 90 percent have at least one regulation that impedes women’s economic opportunities. More than one hundred economies still prevent women from working in certain jobs; fifty-nine economies provide no legal recourse to women who experience sexual harassment in the workplace; and in eighteen countries, men can legally prevent their wives from working outside the home. An array of other legal barriers—from limitations on access to finance to laws restricting women’s agency and mobility—prevent women from fully participating in the economy. Even in 2018, the legal landscape for women in the economy fails to reflect the value women’s participation adds to economic growth. But change is on the horizon. Over the last decade, several countries have enacted legal reforms that significantly advance women’s rights. Today, all but thirty-two countries legally guarantee gender equality in their constitutions, and a record number of countries now have laws prohibiting discrimination or violence against women. While these gains—rightfully celebrated— show that progress is possible, proposals to eliminate the critical barriers that limit women’s economic potential remain absent from mainstream discussions on international and national economic policy, and barriers to female economic enfranchisement persist in every region of the world. In order to realize the economic potential of 50 percent of the world’s population, nations need to do more to level the legal playing field for women. 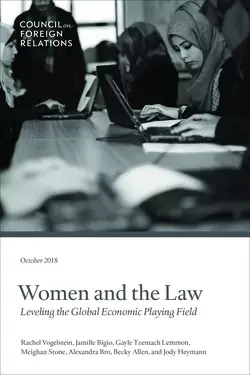 This volume collects in-depth analysis and commentary on legal barriers to women’s economic participation, with a focus on five areas in which the greatest obstacles to women’s economic participation endure: financial inclusion, identification laws, land rights, workplace discrimination, and family law. As this collection of case studies shows, the gains from ensuring that women everywhere have the right to compete fairly in the economy are significant and achievable. Nothing less than humanity’s collective prosperity and stability are at stake.